OgoSport was founded in 2004 by a duo of accomplished designers from the world-renowned school of design, the Pratt Institute. Co-founder Rick Goodwin created the company name to mean “Oh-Go-Outside Sport;" with their core mission being to encourage physical play. OgoDisk RAQ's design is based off of the original OgoDisk but adds the power of a handle and the new Flux ball. The Flux ball comes with three attachable and detachable tails that control the way the ball flies. Attach all three tails to the ball for slower play and remove all for a fast paced game. 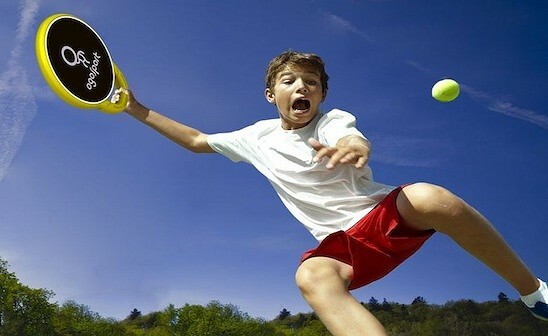 You can bounce any ball on the racket -- beach balls, bouncy balls or even water balloons. OgoSport was founded in 2004 by a duo of accomplished designers from the world-renowned school of design, the Pratt Institute. Co-founder Rick Goodwin created the company name to mean “Oh-Go-Outside Sport;" with their core mission being to encourage physical play.